“How to Pray” reminds readers of the necessity of communion with God through prayer and provides helpful suggestions for how to cultivate a healthy prayer life. 1. NECESSITY OF PRAYER. Jesus taught that prayer is not an option—something to do when we “feel like it”—it is a God-given responsibility. Few of us “find time” to pray, but we must make the time (Ephesians 5:16). 2. THE BIBLE. The Bible and prayer go hand in hand. Pray as you read, and meditate on God’s Word as you pray. As you read the Bible, praise God for what he reveals of himself and pray for strength and wisdom to obey his commands. Try using the prayers of the Bible as patterns: Matthew 6:9–13; Ephesians 1:15–23; Ephesians 3:14–21; and the Psalms are excellent inspirations. 3. PRAYER LIST. 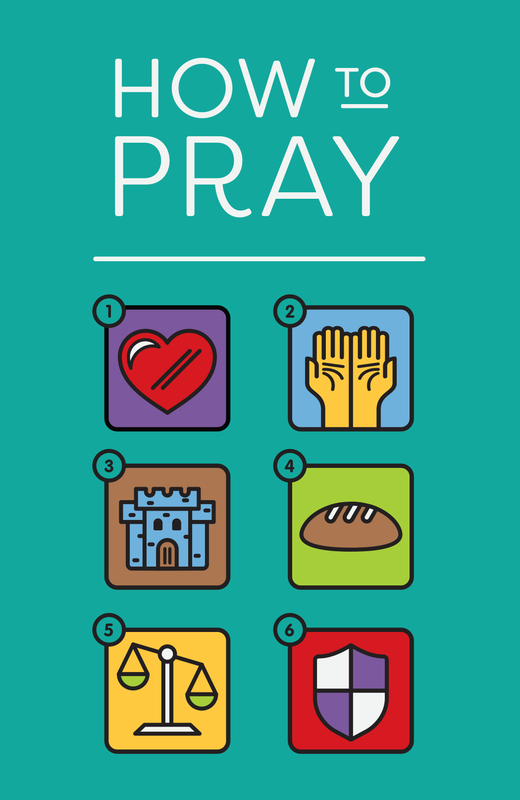 A list of prayer requests reminds you of specific needs and will keep your mind from wandering. By recording how God has answered a request, you will be encouraged to keep praying. But don’t let this steal your spontaneity. You are praying to a Person, not compiling a list! 4. PRAYER PARTNER. To help you pray consistently, ask God for a friend with whom you can share and pray. Meeting regularly provides mutual encouragement. 5. DISTRACTIONS. Because prayer is spiritual warfare, Satan will try to distract you. Ask God to help you pray regularly and he will direct you. If you have trouble with wandering thoughts, try changing positions, praying aloud, consulting a prayer list and your Bible, singing a hymn, or whatever you find most effective. But whatever you do, pray! Lord, teach us to pray, Jesus’s disciples asked. This simple prayer, which Jesus taught his disciples, can also show us how to talk with God in prayer. Our Father in heaven, hallowed be your name. Your kingdom come, your will be done, on earth as it is in heaven. Give us this day our daily bread, and forgive us our debts, as we also have forgiven our debtors. And lead us not into temptation, but deliver us from evil. Jesus taught his disciples to call God “our Father.” It is this intimate father/child RELATIONSHIP that makes prayer possible. As children of God, we come to his throne expectant and unafraid because we are accepted in his beloved Son (Hebrews 4:15–16). Because we are his children, we can speak with our heavenly Father often—he loves to hear our prayers! Worship—to honor and adore God—is the highest privilege of the Christian. We who have experienced the miracle of his saving grace can PRAISE HIM for his greatness and love. Throughout the day, we can offer praise and thanksgiving as he showers us with his blessings. “Ascribe to the Lord the glory due his name; bring an offering and come before him! Worship the Lord in the splendor of holiness” (1 Chronicles 16:29). As God’s children, we long for his righteous reign throughout the earth. But HIS REIGN must first begin in our own lives. We are made sensitive to his will for us as we prayerfully read and meditate on the Word of God. Even as we pray, God exposes our spiritual condition and brings our desires into conformity with his will (Romans 12:2). We are DEPENDENT upon God for all of our needs— spiritual and material. And, like any loving Father, he desires to richly bless us. Nothing is too great for his power; nothing is too small for his love. He invites us to share the most intimate details of our life with him. “Do not be anxious about anything, but in everything by prayer and supplication with thanksgiving let your requests be made known to God.” (Philippians 4:6). As we speak with our loving Father and read his Word, we realize that he expects us to be GRACIOUS to others (Ephesians 4:32). But our unforgiveness and unconfessed sin hinder our communion with God (Isaiah 59:2). Repent and confess of your sin and witness the healing that takes place in your life, but most importantly in your relationship with God. “If we confess our sins, he is faithful and just to forgive us our sins and to cleanse us from all unrighteousness” (1 John 1:9). The Lord has promised to PROTECT his children in the hour of temptation: “No temptation has overtaken you that is not common to man. God is faithful, and he will not let you be tempted beyond your ability, but with the temptation he will also provide the way of escape, that you may be able to endure it” (1 Corinthians 10:13).